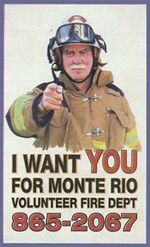 Give back to the community of Monte Rio by getting involved in volunteerism! 1. Task the local fire departments with making the public safety determination (terrain, fire, road condition, emergency vehicle access, adequate parking) that the vacation rental location is appropriate for VR use. Allow no grandfather clause exemptions for public safety issues. 2. Exclusion zone applications at no cost (currently $8,400) to citizens if based on Public Health and/or Safety issues. 3. Require Sherif'f's Dept to verify Vacation Rental Noise complains. As of August 9th, 2017, there is still no PRMD Nightime or Weekend enforcement in place. Sherriffs will not respond to noise complaints in West County because we have no noise ordinance, EXCEPT FOR GUERNEVILLE: Getting reports from Guerneville residents that VR noise complaints are being responded to by the Sherriffs there. This appears be the result of an undocumented request by Efren Carrillo, not a new ordinance. 4. All applications and permits should state septic tank size in gallons and daily load capacity. Require official inspections to determine adequate septic capacity and set a comprehensive formula for this, such as the Arizona Guidelines, below. Include impact of +6 daytime visitors (including all children), and +2 allowance and have these exceptions be noted on issued permits. 5. Develop a plan to inspect previously permitted locations for septic capacity verification, starting with those closest to, and within, the Russian River watershed and/or those which have the highest occupancy allowances. 7. Do not allow advertising that encourages trespassing. 8. Require that online advertising violations be corrected within a week. PRMD currently allows the same 30 days they allow for repair physical violations which require hiring and scheduling workers. These VROs have instant internet access to their listings. 9. Provide adequate funds for reasonable inspection and enforcement of violations such as: weekend and night complaints, and online advertising. Expenditure of Transient Occupancy Taxes should prioritize Enforcement and Improvements to Infrastructure over Tourist Industry Advertising. Enforcement pay should be high enough to encourage job applicants! The PRMD explained at their VRO Workshops in 2015 that only Single Family Dwellings could be used since using second dwelling units provided much needed full time residential housing. Now, there seems to be a loophole allowing vacation rentals in duplexes and triplexes. I think it works like this: You pay a contractor to provide "evidence" that your SFR has historically been used as a duplex and you get a legal non-conforming use designation grandfathered by the PRMD that will not have current parking requirements and make the vacation rental more attractive to larger parties. The PRMD then extends this non-conforming use clause to the vacation rental ordinance. Voila! You now have a bigger vacation rental and no requirement to upgrade the septic capacity! This "evidence" will trump real estate listings describing the property was recently purchased as a Single Family Residence by the person seeking the now legal non-conforming use. Here is my Sept 2016 conversation with the county planner about a non-conforming duplex being allowed as a vacation rental. According to the prmd planner, "I looked at the assessor notes and they do show that there has been two kitchens since 1950. Due to the fact that the residence had two kitchens before the county had a zoning code, it is able to be used as a vacation rental. These records are available to the public if you would like to take an additional look at them." There may have been two kitchens in 1950's or 60's but there were not 2 kitchens the last 2 times the property was sold: I saw the listings advertising a SFD with a downstairs "bonus room", went to the open house and saw the empty "bonus room", lived nearby while the 2012 owner turned the "bonus room" into a 2nd unit, and know that the previous tenant had been using this "bonus room" as a grown room. I was told that the assessor notes were not available to the public when I went to see what evidence was provided that showed there was 2 kitchens continually since 1950, which may, or may not, be a requirement to get a non-conforming duplex use designation. 11. Have a moratorium on new applications until the above issues are resolved. The PRMD does not monitor internet advertising for compliance. Compliance with 2016 rule that property management must be tested and certified will not be required until 2018. Why the delay? Noise complaints made to property managers are not being being addressed. Will this also not be required until 2018? The testing/certification is useless since anyone can have two browser windows open at the same time to double check answers or just have a printout of the Performance Standards handy to guarantee passing the test. When this was pointed out to the PRMD the response I got was that many people complained that the test was too difficult. The county charges for this useless certification and hopefully these fees cover administration! The source of the information provided in the below tables is the Arizona Department of Environmental Quality website. 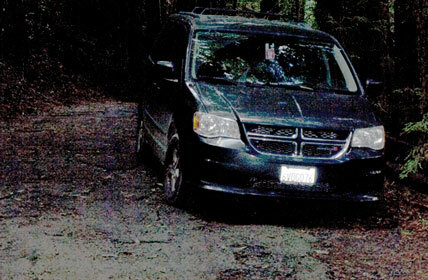 Efren Carrillo really threw river residents, and the river itself, under the bus with the April 2016 "improvements" to the Vacation Rental Ordinance: He completely ignored concerns that were presented to him about public health and safety issues with vacation rentals being permitted on narrow un-maintained roads (2-way, single lane roads on steep heavily forested hillsides), occupancy allowances which exceed septic design load, noise from huge late night parties, loss of affordable housing and impact to infrastructure and neighborhood character. Our 5th District Supervisor was pushing for special zoning for "Historic Resort Areas" which would have made it easier to blow off residents concerns with overcrowding issues. A new Vacation Rental Exclusion Zone was implement but Efren didn't submit a single location in West County for this new zoning. Overnight Occupancy is still determined by number of bedrooms, with 2 per bedroom, plus 2 , with no verification of septic load capacity. Daytime Occupancy automatically allows an additional 6 visitors with no consideration of how this further stresses septic design capacity. 6 additional visitors can be expected to swim in the river, soak in the hot tubs and then take showers. 102 Permitted vacation rentals in Monte Rio 2011 - March 2018 - with contact info for complaints: 76kb excel file Note: Vacation Rental permits which have been revoked will also show up on this list, except the PRMD has never revoked a Vacation Rental Permit (per Aug, 18, 2015 public meeting) Double check current status by a Search by Address or APN. 16 of the 102 permitted vacation rentals in Monte Rio have a current data status of APRVD-CC which means Application Approved Without Pre-Conditions Being Met. Monte Rio currently has 102 permitted Vacation Rentals for up to 702 overnight guests. An additional 720 daytime visitors are allowed for a potential total of 1,422. There are also quite a few un-permitted and/or noncompliant Vacation Rentals, some of which can be found on the VRBO website and the AIRBNB website. Internet advertising is making it easier for residents to prove to the PRMD that neighboring homes are operating illegally. THE PRMD doesn't seem to have the resources to check vacation rental websites for local compliance. Search by Address or APN - You can search for Vacation Rental zoning permits on the PRMD Permit History page to check for permit number, current status, occupancy allowance, exceptions to allowances and 24/7 complaints phone number. If there is no address visible, start with your address to find the correct parcel map at the Assessor's search page. PRMD Reports - All Sonoma County applications for zoning permits for Vacation Rentals can be found on the PRMD Reports page. Vacation Rentals will be listed in the Planning Application Reports under SUB-TYPE as CM12. Exceptions to zoning requests, such as reduced number of overnight occupants, only seem to be reported on the yearly reports but no occupancy exemptions have been recorded after 2011. Monthly reports will show the most recent and up to date zoning applications. As of June 2016 the PRMD is no longer using the specific CM12 sub-type designation in their reports and now use inconsistent designations and descriptions of the applications, making it more difficult for the public to research. They also combine VROs and hosted rentals in the same category, which have different requirements. Check out the June 2016 exl spreadsheet. Compare with the May 2016 exl spreadsheet. Permitted Vacation Rentals are expected to meet minimum performance standards. The following Performance Standards are from municode.com and are presumably the most accurate. My comments are in red. The complete section code is here as a 137k pdf file. The county's definition of a bedroom is here. 1. Maximum Number of Guestrooms. Vacation rentals may have a maximum of five (5) guestrooms or sleeping rooms. Vacation rentals with more than five (5) guestrooms or sleeping rooms may only be allowed if adequate sewage disposal capacity exists and neighborhood compatibility can be demonstrated, subject to the granting of a use permit. Many vacation rentals are stretching the definition of "Guestroom" to include porches, dining rooms, small nooks and basements. Some property owners are building additional partitions and turning attic crawls spaces into "sleeping lofts". Some layouts require passing through a bedroom to get to another bedroom. Guestrooms should be inspected before issuance of a zoning permit to verify that guestroom numbers aren't being artificially inflated for profit and putting a greater burden on limited area parking and small septic systems. "Neighborhood compatibility"and "adequate sewage disposal capacity" should be considered for all vacation rentals, regardless of the number of guestrooms. 2. Maximum Overnight Occupancy. Maximum overnight occupancy for vacation rentals shall be up to a maximum of two (2) persons per sleeping room or guestroom, plus two (2) additional persons per property, up to a maximum of twelve (12) persons, excluding children under three (3) years of age. For homes on a conditional septic system, the maximum overnight occupancy for vacation rentals shall be equal to the design load of the septic system. Vacation rentals with larger overnight occupancies may only be allowed subject to the granting of a use permit. Changing the allowance of occupancy per room, making it consistent with normal single family residential use: 1 master bed room for 2 people all other bedrooms only 1 person per. (1 per, plus 1) Overcrowding of single family residences adds to noise levels, parking difficulties and wear and tear on fragile infrastructure. 3. Maximum Number of Guests and Visitors. The maximum number of total guests and visitors allowed at any time in a single vacation rental shall not exceed the maximum overnight occupancy plus six (6) additional persons per property, or eighteen (18) persons, whichever is less, excluding children under three (3) years of age. Vacation rentals with larger numbers of guests and visitors may only be allowed subject to the granting of a use permit. Notwithstanding, maximum guest limits may be exceeded on the following national holidays: Easter, Memorial Day, 4th of July, Labor Day, Thanksgiving, Christmas Eve and Christmas, so long as the holiday event does not otherwise trigger the requirement for a special or cultural events permit. PRMD does not take these additional Plus 6 visitors under consideration when factoring impact on, or compatibility with, the community for parking, trash and waste disposal, noise levels, etc. The Plus 6 allowance should be eliminated. There are local venues available for rent that can accommodate large gatherings that also provide ample parking. 4. Per Parcel Limit on Number of Residences or Structures. Only a single residence, and legally established guest house meeting current standards shall be used as a vacation rental. Only one (1) tenant shall be allowed on-site at any given time: second residences or accessory structures shall not be leased, subleased, rented or sub-rented separately from the main dwelling. Parcels containing multiple residences or habitable structures may only be used as vacation rentals subject to the granting of a use permit, except that two (2) residences or structures may be used when the total number of guestrooms does not exceed five (5.) Tents, yurts and RVs are not allowed as a part of a vacation rental. 5. Required On-Site Parking. Parking shall be provided as set forth in 26-90: one (1) on-site parking space for a vacation rental with up to two (2) guestrooms or sleeping rooms; two (2) on-site parking spaces for a three (3) or four (4) guestroom vacation rental. Larger vacation rentals must demonstrate adequate parking with a minimum of three (3) spaces. On-street parking may be considered. "On-street parking may be considered." should be stricken from the code. It's not fair that local residents (and their visitors) should have to fight for a parking space in front of or near their homes. On-street parking availability fluctuates greatly depending on day of week, season of year and local attractions. The PRMD should not be expected to accurately predict these fluctuations. According to this formula, a "standard" vacation rental could potentially have 16 visitors but only 3 on-site parking spaces, MAYBE! On street parking that is unpaved pulls dirt on to the roads which creates airborne dust. 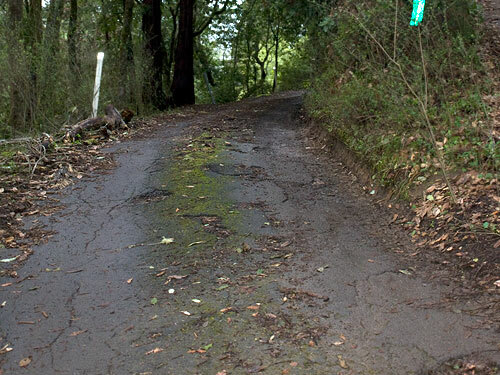 Dirt overtakes road edges giving the illusion that a car can be parked on the side of the road but is actually in the road, restricting emergency vehicle access and safe pedestrian travel. On-site parking should be verified that it's actually on the vacation rental property. If the parking space is directly in front of the vacation rental, are cars able to park so they are fully off the street without blocking emergency vehicles and allowing safe pedestrian access? Properties on single lane, un maintained county roads: Wear and tear from additional traffic, wine tour vans getting stuck between trees, dust clouds invading residents homes, visitors taking the only parking spots in front of neighbors homes, blocking emergency vehicles with parked vehicles, squeezing cars into the woods on neighboring private property, illegally excavating the hillsides to create additional parking, trespassing on private wooded properties and smoking out resident neighbor's homes with romantic fires on warm summer nights are all problems that are experienced by residents on the two single lane,two-way,, un maintained, county roads that border our properties. Required on-site parking recommendations might be enough if the PRMD were to significantly reduce the overall occupancy allowance. When the river first became a vacation destination the visitors arrived by train. Later, blue collar families would vacation here, piling large families into one car. Now the average visitor to car ratio is 2:1. Vacation rental car parked blocking 1/3 of the single lane road and emergency vehicle access. 6. Noise Limits. All activities associated with the vacation rental shall meet the general plan noise standards contained below. Quiet hours shall be from 10:00 p.m. to 9:00 a.m. I don't understand the noise chart that is provided in the ordinance code but would like outside noise limited/restricted after sunset. Noise from properties on hillsides are acoustically amplified by the terrain and travel great distances. NOISE COMPLAINTS WILL NOT BE INVESTIGATED BY THE SHERIFF AS THERE IS NO NOISE ORDINANCE IN OUR AREA. 7. Amplified Sound. Outdoor amplified sound shall not be allowed at any time associated with a vacation rental unless specifically permitted by a cultural or special event permit, or use permit. See notation below. 8. Cultural or Special Events. Occasional special events, parties, weddings or other similar activities over the maximum daytime occupancy (indoors or outdoors) may be permitted only with a cultural or special event zoning permit up to four (4) times per year for a maximum one (1) year, or by use permit, except in the RR (Rural Residential) and R1 (Urban Residential) zoning districts where special events, outdoor events, lawn parties, weddings or similar activities associated with a vacation rental are not allowed at any time. The current allowance of 2 people per guest room, plus 2 additional overnight guests, plus 6 daytime visitors makes this MEANINGLESS. With this formula, 1-5 bedroom homes can have 10-18 total daytime visitors which IS a party. 9. Pets. Pets shall be secured on the property at all times. Continual nuisance barking by unattended pets is prohibited. This should be clarified: Pets shall be secured on the property at all times by a leash or kennel run if the property is unfenced. I've seen, and heard, far too many dogs lost by visitors. This should be added: When off the vacation property, pet owners must abide by the leash law and pick up pet waste, even in rustic or rural areas. 10. Trash and Recycling Facilities. Recycling and refuse storage bins shall not be stored within public view unless in compliance with neighborhood standards. Strike "unless in compliance with neighborhood standards." which is too open to interpretation. 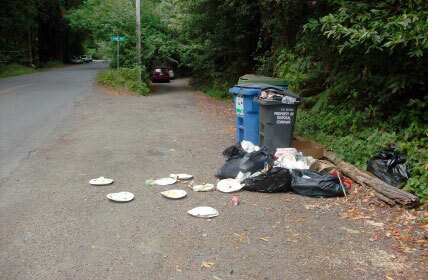 Should the "neighborhood standards" be set by responsible residents who put trash cans out the night before collection and remove cans and clean up any mess created by foragers the same day as collection? Or, by the meth freaks, hillbilly hoarders, paranoid schizophrenics, and other VACATION RENTALS that are in the neighborhood? Would suggest a 24 hour limit requirement for cans left out, put away and cleaned up after. Vacation Rental Garbage on Monte Rio Ave. It eventually gets washed into our watersheds. 11. Septic Systems and Sewer Connections. The owner shall maintain a properly functioning septic system or sewer connection. In some cases, a per-room sewer fee may be applied. All septic systems should be inspected prior to granting a vacation rental zoning permit to determine that it's load capacity can handle the stated Maximum Number of TOTAL Guests and Visitors, including children. The PRMD only issued occupancy exceptions to the operating permits in Monte Rio in 2011 based on septic capacity. 12. Transient Occupancy Tax. The vacation rental owner or authorized agent shall maintain a transient occupancy tax license and remain current on all required reports and payments. Owner or authorized agent shall include the license number on all contracts or rental agreements, and in any advertising or websites. Vacation Rental Zoning Permit Number should also be required on all advertising and websites. This would help the PRMD to check internet advertised Vacation Rentals and confirm compliance with zoning requirements. Currently the County doesn't have a system in place that cross references TOT licenses with zoning permits. Perhaps it would easier monitor or there would be greater compliance incentive if the zoning permit was required before the TOT license? 13. Designated Representative. Applicant shall provide a current 24-hour working phone number of the property owner, property manager or other designated representative to all neighbors within a one hundred-foot radius of the subject property boundaries, and to the county permit and resource management department, and any change shall also be reported and noticed to neighbors within thirty (30) days. Said property owner or designated representative must be available during the rental period within a one-hour drive of the subject property. Clarify this to read must be able to respond, 24/7, on-site, within 1 hour. As written, "during the rental period", exempts owners/managers from responding promptly to problems that occur after the rental period such as garbage which is left out and attracting vermin. Notification of neighbors within a 100' radius of the property is not enough when neighbors live on the same narrow single lane, un maintained public road. Impacts from noise, parking problems, air pollution from dust, and trespassing are exacerbated in this situation. Perhaps Vacation Rental zoning permits should not be allowed on narrow single lane, un-maintained roads at all? Roads that must be kept clear by residents out of self defense should not be considered either. 14. Emergency Access. Any vacation rental located behind a locked gate or within a gated community shall provide gate code or a lockbox with keys ("Knox Box" or similar) for exclusive use by the sheriff and emergency or fire services departments. 15. Posting of Standards. The owner shall post these standards in a prominent place within the vacation rental and include them as part of all rental agreements. All advertising handouts, flyers, or any other information provided for vacation rentals shall conform to the approved occupancy limits and standards as stated on the vacation rental permit. Advertising may only be conducted for properties operating under a valid permit. An additional standard should be added requiring notification to renters that they must not trespass on private wooded property, even if there are no structures or No Trespassing signs on the private property. Unless there is a sign stating that it is a public park, keep out! Near my home these private wooded areas are used as wildlife corridors but vacation renters and some new, inconsiderate vacation home owners treat them like public parks, forcing wildlife on to the roads, leaving trash, trampling native flora and letting unleashed dogs run amok. 1. Initial complaints on vacation rentals shall be directed to the contact person identified in the zoning permit or use permit, as applicable. If the issue reoccurs, the complaint will be addressed by PRMD code enforcement section who shall conduct an investigation to determine whether there was a violation of a zoning or use permit condition. Code enforcement may accept neighbor documentation consisting of photos, sound recordings and video to support proof of a violation. If code enforcement verifies that a zoning or use permit condition violation has occurred, a notice of violation shall be issued and a penalty may be imposed in accordance with Chapter 1 of the Sonoma County Code. At the discretion of the code enforcement officer, the zoning permit or use permit may be scheduled for a revocation hearing with the board of zoning adjustments. If the permit is revoked, a zoning or use permit for a vacation rental may not be reapplied for or issued for a period of at least one (1) year. Per the PRMD, to date ZERO vacation rental permits have been revoked. Illegal Vacation Rentals than could never pass the performance standards or grossly violate the standards should be dealt with more stringently with a shortened Grace Period. It's pointless to not to have real consequences for violators. Enforcement guidelines that the county will actually follow should be made clear to neighbors whose peaceful enjoyment of their homes is being compromised. 2. An annual fee may be adopted by the board of supervisors and collected by PRMD or the county tax collector to pay for monitoring and enforcement of vacation rentals. DO IT! It would be great if the PRMD had the resources to monitor websites like VRBO.com and Craig's List for legal, accurate and compliant listings. As per Sonoma County document CDE-013, "The Vacation Rental Ordinance does not regulate off-site impacts, such as street parking, speeding, or the conduct of renters when off of the property". This makes it even more critical to to tighten up definitions of property capacity, requirements of on-site parking and notifying renters of private property laws and local leash and pet waste disposal laws. The main Sonoma County web page for Vacation Rentals is here. 20030 River Blvd, Camp Como - permitted for 2 guestrooms, 4 max overnight. Advertising 5 guestrooms, sleeping 10, courtesy of Russian River Getaways. Monte Cristo Ave, River Queen - 7 bedrooms that sleep 20! Snippets from a visitor review: "A group of 15 adults stayed here for a week. The bedroom/bathroom situation was not good. For 4 of the bedrooms you have to walk through one bedroom where a couple is sleeping to get to another bedroom." and "The septic system seems to not be able to handle multiple showers and toilet use and back ups which caused the bathroom sink to clog along with water from one toilet leaking and soaking the floor." Courtesy of Russian River Getaways. 20591 Park Ave - AKA 20591 Monte Rio Ave, 20590 Monte Rio & 20592 Monte Rio - Currently (4/16/15) applying for vacation rental permit after operating without a permit since 2013. Violation letter send 8/21/14 PRMD never made them stop advertising. House was on the market as a 1 bedroom, 1 bath, 1 kitchen, single family residence with a bonus downstairs area in 2012. Somehow got designated a duplex, 10/13/14. Advertises that it sleeps 8. Garbage cans left out 24/7. Did an illegal and unprofessional excavation in bottom side of a steep hill to create a parking space that only allows 9.5 ft for emergency vehicle clearance, IF they jam in tight. Created what they call a two car space, but regularly jam in 3 cars, in front of their neighbor's property on the top side of the hill that is partially supported by 2 small bay trees. Located on a narrow, single lane, two-way, un-maintained county road with barely adequate parking for other homes. Of course, the visitors there leave no parking for other residents. When confronted about visitors trespassing on neighboring properties the owner made it clear that she felt it was the property owner's responsibility to post signs and put up fences. Personally, I wish people would I assume property is private unless it's posted as a public park. 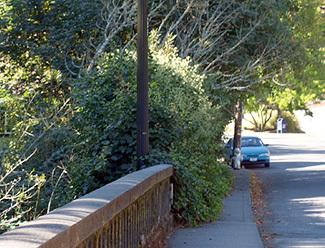 This photo shows a portion of Monte Rio Ave leading to a property that is currently requesting Vacation Rental use permit for 8 overnight and 14 daytime visitors. On March 25 there was a fire on this road where the fire truck's outer wheels went off the road and almost plunged down the hillside. A. Require that a healthy portion of TOT funds collected be earmarked for going into the same local community's infrastructure where the taxes are collected. B. Do not allow vacation rental zoning permits to any property which are located on un-maintained single lane roads where increased traffic will impact already poor road conditions, air quality and limited resident parking. C. Put a limit on number of permits allowed so there is still some affordable rental housing and a real community can be maintained. No more than 10%? D. Correct documents on the county website so they are consistent with the facts and each other. E. What about insurance? Will their home owner policies cover damages caused by or to vacation renters? Would evidence of coverage be a good idea? F. Require a zoning permit before the TOT license? Require individual TOT number per property. 1. Verify that the number of guestrooms are true to the original plan of the structure and not allow artificial inflation of number of guestrooms. Indications of artificial inflation of number of rooms should include remodels of attics and addition of partitions that require passing through a guestroom to access another guestroom. Note: it was pointed out at the public meeting in Monte Rio that the PRMD has a broad definition of a bedroom/guestroom and they currently allow 2 guests per room. The perfect answer to this would be to define occupancy according to normal single family residential use: 1 master bed room for 2 people all other bedrooms only 1 person per. 2. Do not allow the plus 2 overnight occupancy rule automatically. 3. Do not allow the Plus 6 visitors to the property automatically. 4. Provide a more thorough investigation when single family residences are requesting an official change to multiple family residences to legal non-conforming duplexes. It's easy enough to check online if a property recently sold as a 2 bedroom Single Family Residence with 1 bedroom, 1 bath but is being presented as a bogus grandfathered 2nd unit. 5. Strike On-street parking may be considered from the standard and increase number of on-site parking space requirements. Verify that the stated On-site parking is actually on the property. 6. Don't allow any exterior noise after sunset if neighbors are disturbed. 9. Revise the Pet Standard to read: Pets shall be secured on the property at all times by a leash or kennel run if the property is unfenced. When off the vacation property, pet owners must abide by the leash law and pet waste pick up law, even in rustic or rural areas. Continual nuisance barking by unattended pets is prohibited. 10. Strike unless in compliance with neighborhood standards from the Trash & Recycling Facilities standard. 11. Require mandatory septic inspections of all vacation rentals to assure that the system can handle the daily load of allowed total guests, children and daytime visitors. 12. Require that the zoning permit number also be required on any advertising. Designated Representative & Complaints. Applicant shall provide a current 24-hour working phone number of the property owner, property manager or other designated representative to all neighbors within a one hundred-foot radius of the subject property boundaries, and to the county permit and resource management department, and any change shall also be reported and noticed to neighbors within thirty (30) days. Said property owner or designated representative must be able to respond, 24/7, on-site, within 1 hour. >>. Insert a performance standard before 15. Posting of Standards which explains to renters that surrounding undeveloped properties are to be respected according to the law as Private Property and are not to be trespassed upon by them or their pets, unless otherwise indicated with signage as a public park. PJR-096.pdf - This is the summary of regulations provided with the required Supplemental Application and Affidavit forms for people applying for Vacation Rental Zoning Permits. It's missing six of the fifteen Performance Standards: Numbers, 7, 8, 10, 12, 14 and 15. It includes a standard that isn't mentioned in the zoning ordinance which is labeled 'Technical Codes'. Number 13 states that the emergency contact can respond on-site to issues or complaints within an hour. Performance_Standards.pdf - This informational document is also missing six of the fifteen Performance Standards: Numbers, 7, 8, 10, 12, 14 and 15. It also includes a standard that isn't mentioned in the zoning ordinance which is labeled 'Technical Codes'. Number 13 misstates that the emergency contact must reside within 30 miles of the vacation property. vacation-rentals-final-ordinance.pdf - This document is the most complete and accurate but the Standards are miss-numbered and there is at least one spelling error. Number 13, per the actual code, states Said property owner or designated representative must be available during the rental period within a one-hour drive of the subject property. Please don't feed raccoons! Adding unnatural food resources, intentionally or not, encourages over population of their natural habitat and increases the infection risk of Baylisascaris procyonis roundworms to people and their pets. An informational flier is available here as an 111k pdf file. When microscopic larvae are accidentally ingested or inhaled they can migrate to the eyes and brain and cause blindness, migraines, neurological disorders and death. Raccoon have a symbiotic relationship with the parasite and seem to suffer no ill effects as their host. IVY - ALIEN INVASIVE SPECIES: KILLING OUR REDWOODS! Emergency intervention is needed NOW! It's autumn: English ivy is blooming and will soon produce berries that spread this tenacious and destructive species. Please remove all ivy blossoms/berries from your property. Talk to your friends and neighbors. Organizing work parties are a great way to foster community spirit! Ivy on Main St, from the Dutch Bill Creek Bridge to the Pink which was removed by a local resident. Mouse over image for after photo. Mouse over image for 'after' photo. Another bonus: The old cyclone fence, once exposed, was determined to be unsafe and the county replaced it with a new and more attractive one! Mouse over image for 'after' photo. English ivy is not native to the United States and has no natural predators or pests to keep it in check. It easily escapes from planting areas and invades natural areas, parks and urban forests. It creates "Ivy Deserts" - areas so dominated by ivy that no other vegetation survives. Ivy as ground cover crowds out native flora AND fauna. Despite popular belief, ivy is NOT a good ground cover for erosion control due to its shallow root system and suppression of other plants. When it crowds out native plants on stream banks, it degrades water quality. Remove ivy from redwoods and other trees, it smothers and kills them. By adding weight to limbs and reducing air flow around the tree's trunk, ivy makes a tree more susceptible to canopy failure, wind stress and disease. It can also strangle trees around their base and reduce the flow of nutrients up and down the tree. Keep a 6 foot ring around trees Ivy Free. Remove ivy from building structures, it undermines structural integrity, contributes to wood rot and mold. English ivy does not provide a significant food or habitat for native wildlife, but does provide habitat for RATS. When using ivy as part of your landscape it's easier to manage and control when rooted in pots. Ivy not in pots needs close, regular inspection to make sure it doesn't spread and get out of control. Since mature ivy blooms in the fall and has purple black berries in the winter (when it's further spread by birds) you may not even be around to know just how widely ivy on your property is contributing to to the destruction of our delicate coastal redwood habitat. If you are not a full time resident that is willing to keep an eye on ivy being cultivated on your property PLEASE REMOVE IT! You will be amazed by the quick recovery of native species if you do so. Darrell Sukovitzen, The Tree Climber, has written an excellent pamphlet on Redwood Care. 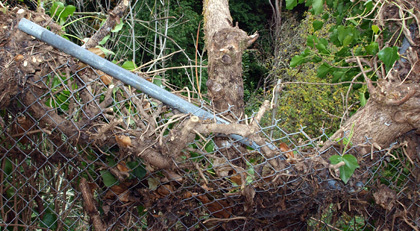 Girdle - The most basic technique to stop tree-climbing ivy dead in its tracks. Full Lifesaver - After girdling a tree work to clear the surrounding area of ivy. Imagine a 6-foot radius circle around the tree you have girdled; begin by peeling back the ivy mat 6 feet from the tree and thoroughly pull every vine and root from the circle. You may also find it helpful to cut "slices" in the ivy mat within your imaginary circle and rip out ivy like a piece of pie. If you are working on a slope, pull downhill and let gravity work with you. Research has shown the once ivy has been pulled more than 6 feet away from a tree it will continue to grow away from the tree rather than towards it again in most cases. Our field tests have shown that a good 6+ foot Lifesaver will slow the re-infestation of a tree for over 5 years! The keys to an effective Lifesaver are consistency and patience; all vines and roots must be removed. Log Roll - This method is most effective in areas with a serious ivy problem, and when used properly can be quite efficient and gratifying. Begin by designating the area to be log rolled (a hillside or group of infested trees). Mark the top perimeter by cutting a line in the ivy mat, be sure to get every vine! 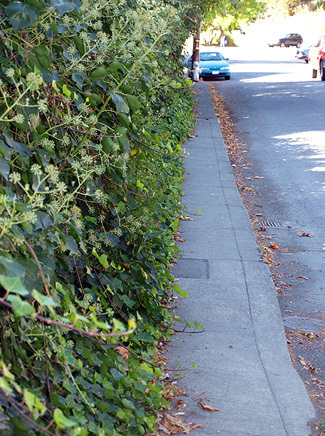 If you are on a slope, cut horizontally across the slope to allow the ivy mat to be pulled downhill. Start to lift the mat and pull the cut edge of the vines downhill, rolling the ivy mat over itself. Let gravity do most of the work but also be aware of your surroundings unless you regularly perform backwards somersaults. Scan for native plants that may make rolling difficult and cut a line in the ivy perpendicular to your pulling edge so that the vine mat can be pulled around; this saves native plants that might otherwise have been uprooted by the thick mat and makes the log roll much more manageable. If you find yourself with a stuck roll proceed to divide the log into several pieces and slice out the remaining perimeter. Treat the ivy cuttings as yard waste. Compost the remains only when dry and dead. Don't leave clippings or piles where they may re sprout! When dried, the clippings will break down, but beware of seeds. Ivy Out - How to remove ivy. Small gestures can have a huge impact! Unfortunately, one small bit of litter seems to create a domino effect: Litter is a magnet for more litter. 1. Go for a walk and bring a bag for any garbage you find. 2. 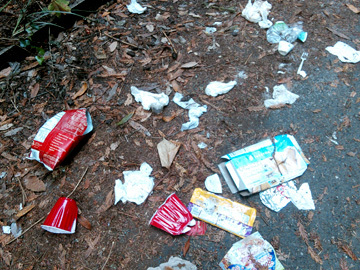 Check for litter on and near your property. 3. Chose a length of road or block and "adopt" it. 4. Gather garbage from the beach after a storm. 5. Have a dog? Please pick up your dog poop! This isn't just a city issue! 6. Smokers: Carry a pocket ashtray. Altoid tins work great for this. Give extra tins to smoking friends. 7. Organize a street clean up party: This helps to create public awareness and educates our children! Street cleaning parties can be listed on the Monte Rio Central events calendar! 8. Prevent raccoons from raiding your garbage cans: Keep all food scraps and food soiled paper frozen or refrigerated and put in your can no sooner than the night before collection. Rinse containers of food before recycling. Spray your can with a strong solution of vinegar & water as a deterrent. Secure the lid with a bungee cord or heavy weight. Clean up your can area the same day as garbage collection. 9. Throwing food scraps into the woods is not composting nor is it ecologically sound! If you are using a composting system be sure to maintain it regularly and secure it so you don't attract and breed vermin. 10. Make this a golden rule: Try to leave every place cleaner than you find it. 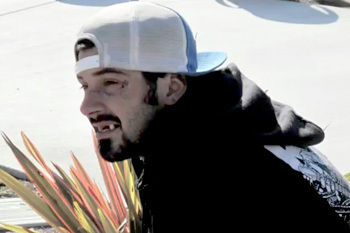 2011: 41 skateboard related fatalities in America. Link to project designer's web site. The Mission of the Friends of Monte Rio is to enhance the quality of community life in Monte Rio, CA by sponsoring a series of social events and educational programs within the MRRP District. Whether you want to coordinate an event, volunteer for a project, contribute funds or be part of the audience - we count on your involvement! 5550 Skylane Blvd. Suite A, Santa Rosa, CA. Is your property near a nutrient or pathogen impaired water body? Click HERE. We are sending this email to all members of the Friends of Villa Grande in order to alert you to proposed regulatory changes that have significant impact on every septic system in our area. The North Coast Regional Water Quality Control Board (WQCB) is proposing a change to its Basin Plan that affects all properties in our area. They provide only three options for existing septic systems located in a designated high priority area. The options have arisen out of a study that has attempted to define the total maximum daily load (TMDL) of pollutants that can be allowed to enter the Russian River without causing degradation of the water quality. Monte Rio and Villa Grande are considered a high priority area. Option 1: Install supplemental treatment on your septic system to reduce bacteria in the wastewater. Homeowners in the Hacienda area testified at a public meeting that they have received estimates of $19,000 to $45,000 to do this. This option also requires monthly monitoring of the septic system by the property owner and quarterly monitoring by a "service provider". Option 2: Connect to a sewer system within 10 years of adoption of the regulations. Option 3: Permitting of the septic system under a Local Agency Management Program (LAMP). The specifications for what constitutes a LAMP and who will run it are vague and it is difficult to assess the costs and regulatory impacts associated with this option. Annual inspections of the septic system are still mandated. Although we applaud the efforts of the WQCB to clean up the river, we feel that the regulations proposed for septic systems are overly restrictive and not supported by the findings of the TMDL study. A full copy of the proposed Basin Plan amendment is available HERE. Written comments are due by 5pm, Oct. 8, 2015 and can be sent via email. There is a public hearing on Nov. 19 at 8:30 a.m.at the North Coast Water Board offices. A link to this notice is HERE. We have drafted a sample letter (below) for you to cut & paste, or as a guide to create and send your own letter to: NorthCoast@waterboards.ca.gov NOTE: if emailed, letters must be in a PDF format. Time is of the essence to respond to this draft amendment. Please contact Charles Reed at the Water Board if you have any questions or concerns. I am a property owner (resident) of property potentially located in a high priority area for onsite wastewater disposal systems as designated in the proposed Basin Plan amendment. 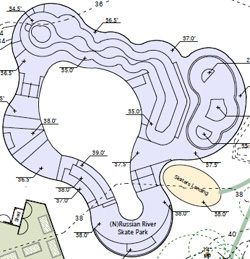 The options proposed for existing onsite wastewater disposal systems in the Basin Plan amendment are unnecessarily burdensome, poorly substantiated by the study and not a cost effective solution for reduction of bacterial load on the Russian River from onsite septic systems. The TMDL study did not adequately identify bacterial pollution from properly functioning septic systems versus failing or inadequately constructed septic systems. It is inappropriate to propose a broad-brush condemnation of all septic systems in the high priority areas when a significant number of the systems are modern, fully functioning systems. There should be a detailed examination of which septic systems are contributing to the bacterial pollution of the river and your efforts should be focused onto those systems. In addition, there needs to be adequate financial support in the form of grants, tax credits and government support to individual property owners for the three options proposed. The outline of funding sources in the document is vague. Most funding sources mentioned in the staff report are only available to public entities and most are in the form of loans. Property owners in the lower river area cannot afford to pay back loans for the extremely expensive septic system upgrades that are proposed. We need to have a program that allows individual property owners to obtain direct financial support (not in the form of a loan) for septic system upgrades. Without this, there will be severe financial hardships that will result in difficulties in compliance with the standards. Additionally, a tiered approach to septic system compliance as outlined in the AB885 statewide standards for septic systems is a more reasonable solution and will mitigate unnecessary financial impacts to owners of compliant septic systems. Overall, it appears that there is a rush to adopt and implement a plan that has potentially severe ramifications, and which may not lead to the desired outcome. Please consider removing the TMDL from the November meeting calendar and engage further with the communities and the County to develop a TMDL that we all can support. I look forward to seeing a reasonable, effective and affordable plan for reduction of pathogens in the Russian River. Persons wishing to comment on the draft Basin Plan Amendment, draft SED, and draft staff report for the Regional Water Board to consider, are invited to submit them in writing. To be evaluated and responded to by the Regional Water Board, and fully considered in advance of the hearing, all written comments and evidence must be received by the Regional Water Board no later than 5:00 p.m. on October 8, 2015. Untimely submittal of written comments will not be accepted or responded to. Please send comments to the attention of Charles Reed at the North Coast Regional Water Quality Control Board to the mailing address below or electronically to the email address Charles.Reed@waterboards.ca.gov, or by fax to 707-523-0135.